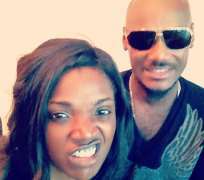 Wife of 'African Queen' singer, 2Face Idibia, Annie Macaulay, is presently excited and the reason is not far-fetched. The actress is expecting to give the singer she married in early 2013 his seventh child, though from three different mothers. Few days ago, Annie jetted out of Nigeria to the United States of America (USA), where she is expected to give birth to her baby. Recall that some years ago, precisely in 2008, the actress left Nigeria to the US to give birth to her first child for 2Face, Isabela, who we learnt followed her mother to this present trip. A happy Annie has been posting pictures of herself in the Uncle Sam's land since she arrived there. Annie is expected back home in some months' time, after she must have been delivered of her baby. The popular actress celebrated her birthday last week and got a romantic message from her husband on her special day.